We are conducting research to develop an understanding of the opportunities and constraints of cell-based sensor systems. This work is done in collaboration with Pamela Abshire (ECE, UMCP), Ricardo Araneda (Department of Biology, UMCP), and Anita Spetz (Linkoping University, Sweden and University of Oulu, Finland). We have two long-term goals for this research. Use cells as sensors to transduce stimuli into externally-readable outputs. Develop technology to study cellular events and processes at the level of single cells or small groups of cells. The system hardware concept is shown here. It consists of microfabricated structures on CMOS sensors and circuitry to allow in situ, real-time sensing, and highly parallel, automated measurements. CMOS technology allows one to realize high density, high-performance arrays for detection combined with sophisticated on-chip signal processing. Vials on the surface of the CMOS chip will enclose different cell types positioned above sensor array. The vials may require lids that open and close, depending on the type of cell and the type of measurement. The chip is packaged to expose the center (approx. 2.5 mm x 2.5 mm) to cells and cell medium, but insulate the bond wires that connect the chip to the outside world. 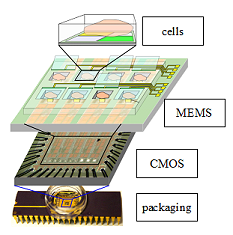 T. Datta-Chaudhuri, P. Abshire, and E. Smela, "Packaging commercial CMOS chips for lab on a chip integration," Lab Chip, 14 (10), 1753 - 1766 (2014). T. Datta-Chaudhuri, N. Halonen, A. Hassinen, P. Möller, S. Kellokumpu, P. Abshire, A. Lloyd-Spetz, and E. Smela, "Integration of CMOS chips into LOCs for cell-based sensing" in Biosensors 2014 (Melbourne, Australia, 2014). T. Datta-Chaudhuri, P. Abshire, and E. Smela, "System-on-chip considerations for CMOS fluidic and biointerface applications," 2014 IEEE International Symposium on Circuits and Systems (ISCAS 2014), special session Complexity in Heterogeneous Systems on Chip: Analysis and Design Techniques, Melbourne, Australia, vol. ISCAS 2014, p. 2009 - 2012 ( June 1-5, 2014). M. Dandin, P. Abshire, and E. Smela, "Polymer filters for ultraviolet-excited integrated fluorescence sensing," J. Micromech. Microeng., 22, 095018 (2012). M. Dandin, I. D. Jung, M. Piyasena, J. Gallagher, N. Nelson, M. Urdaneta, C. Artis, P. Abshire, and E. Smela, "Post-CMOS packaging methods for integrated biosensors," 8th IEEE Conference on Sensors (IEEE Sensors), Christchurch, New Zealand, (IEEE), p. 795 - 798 (Oct. 25 - 28, 2009). N. Reeves, Y. Liu, N. M. Nelson, S. Malhotra, M. Loganathan, J.-M. Lauenstein, J. Chaiyupatumpa, E. Smela, and P. Abshire, "Integrated MEMS structures and CMOS circuitry for bioelectronic interface with single cells," IEEE Int. Symp. Circuits and Systems (ISCAS04), Vancouver, BC, Canada, vol. 3, p. 673-676 (May 23-26, 2004). E. Smela, M. Christophersen, S. B. Prakash, M. Urdaneta, M. Dandin, and P. Abshire, "Integrated cell-based sensors and cell clinics utilizing conjugated polymer actuators," SPIE 14th Annual Int'l. Symposium on Smart Structures and Materials, Electroactive Polymer Actuators and Devices (EAPAD), San Diego, CA, (SPIE), vol. 6524, edited by Y. Bar-Cohen, p. 0G 1-10 (2007). M. Urdaneta, M. Christophersen, E. Smela, S. B. Prakash, N. Nelson, A. M. Haas, V. Jeng, and P. Abshire, "Cell clinics technology platform for cell sensing," IEEE/NLM Life Science Systems & Applications Workshop, Bethesda, MD (July 13-14, 2006). M. Urdaneta, Y. Liu, M. Christophersen, S. Prakash, P. Abshire, and E. Smela, "Integrating conjugated polymer microactuators with CMOS sensing circuitry for studying living cells," SPIE's 12th Annual Int'l. Symp. Smart Structures and Materials, EAPAD, San Diego, CA, vol. 5759, edited by Y. Bar-Cohen, p. 232-240 (March 7-10, 2005).